Cultures, languages, and ways of being may be invented within game worlds. Ludea is a world in which three tribes subscribing to conflicting ideologies define their territories along lines of communi­cation. Each tribe gathers resources and tags in colour-neo-material­ist orange, post-symbolic green and post-human blue. Victory goes to the clan that achieves the widest domain. The Ludeans come from a generation that has grown up with games, abstract machines, and digital processes. It has become second nature for them to make abstractions of reality in terms of models, systems, processes, and flows. The world of Ludea explores the post-human condition and unstable nature of contemporary existence via three contrasting experiences of place. This occurs through signs and symbols that are mapped onto real-world loca­tions to create meaningful connections and experiences across three different public spaces: virtual, networked and physical. Ludeans subscribe to one of three different ideologies: neo-ma­terialism, the post-symbolic, and the post-human. Each ideology represents a position of distrust with a particular mode of communi­cation and has developed an alternative language to avoid using this particular mode. By way of example, the post-linguistic has come to distrust written and spoken words, and they have embraced com­munication that consists solely of gestures and synaesthetic icons. The work also draws on theories of “possible worlds” generated by the combination of artificial intelligence (Al), digital games, and the idea of “world building” through invented language and culture. On a more metaphorical level, the work creates interactive spaces and systems that manifest experiences of a world characterized by uncertainty, multiplicity, complexity, and connectivity. Thus, it makes us aware of the changing nature of reality. 1. Several computer graphic icons were placed at key points in streets and laneways. In many cases, the locations were recre­ated within 30 computer graphics software to generate match­ing shadows and other details. 2. 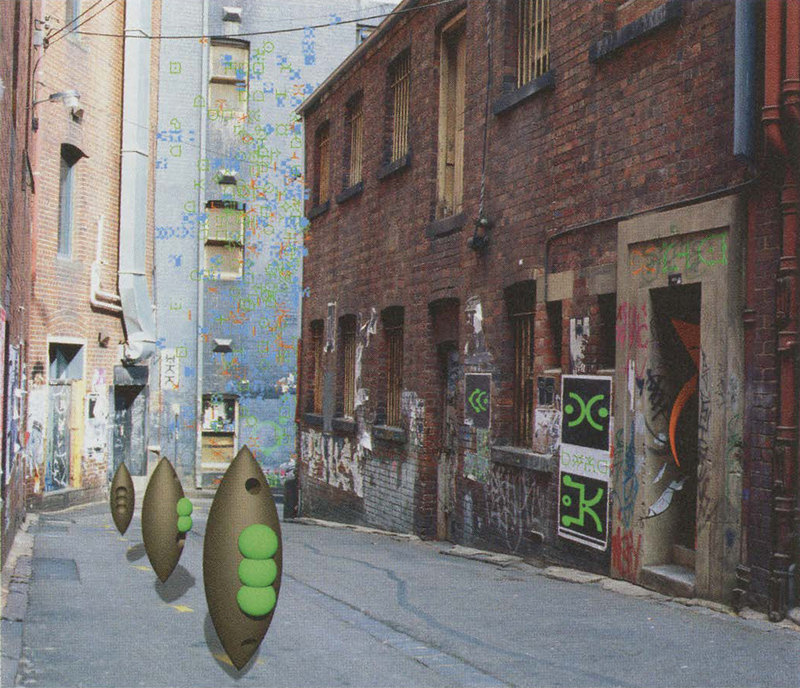 Three animated computer graphic figures were placed in doorways, shifted through the various spaces, and composited onto streets. 3. Custom software for generation of glyphs from possible icono­graphic languages was developed. This generative system draws, breeds, and animates glyphs from the three cultures represented in the work. Clouds of these glyphs were gener­ated and animated for particular scenes in the piece.